Italian builder Dominator chose the lovely city of Fano to present their new model this spring. 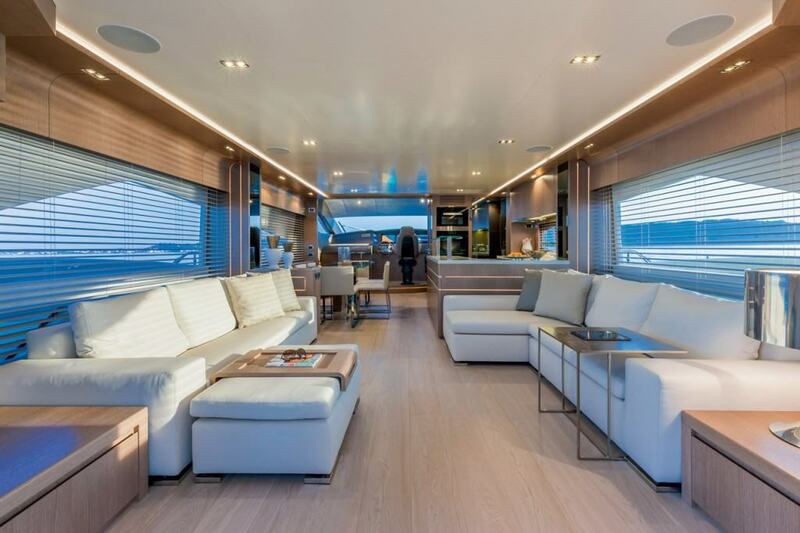 The dashing new Dominator 800, based on the 780 platform, differs from its predecessor in almost every way, and is in every detail representative of the builder’s new philosophy. Ever since five years ago Dominator got a new ownership structure, they’ve been bending themselves backwards to please the client, offering in addition to mere customizable delights some of the best technical solutions on the market. Dominator 800 shows what the yard is capable of when no limits are set. Built in carbon composites with laminate lighter by 25% – weighing only 15 tons – the yacht is sturdy, light, stronger to torsion forces and with lower center of gravity, the thing one can also feel onboard. Powered by Fortjets 4000 double-propeller pods, the 800 is impressively maneuverable, surprisingly frugal with fuel and, since it has no shafts that usually hog a lot of the space, offers bigger, more comfortable cabins. Still, nothing on the outside reveals this increase in volume and efficiency, and neither does the impressive speed of the yacht, as its propulsion is 5% more efficient than the one traditionally given by the shafts only due to absence of propeller inclination. Dominator also equipped the 800 with the Humphree Interceptor flaps that do wonders for maneuverability and overall performance, as well as allow the owner to save fuel, as the system is capable of memorizing your preferences. In addition to all these lovely, but to most owners invisible improvements, Dominator 800 offers plenty of other new delights to be seen and enjoyed, the first among them design and aesthetics. Although the Dominator 800 was designed according to the owner’s wishes, it still bears the designer’s signature: designer Alberto Mancini is definitely one of the aces up Dominator’s sleeve. The owner of the 800 we tested had the final say in interior design, while his long-time skipper suggested several technical solutions – and they both got what they wanted. The client was especially keen on having Minotti sofas in the salon made especially for him, and Botticino marble in all the bathrooms, all the cabins made in soft colors and soft lighting. The salon is large and connected to the galley, without visible obstacles. 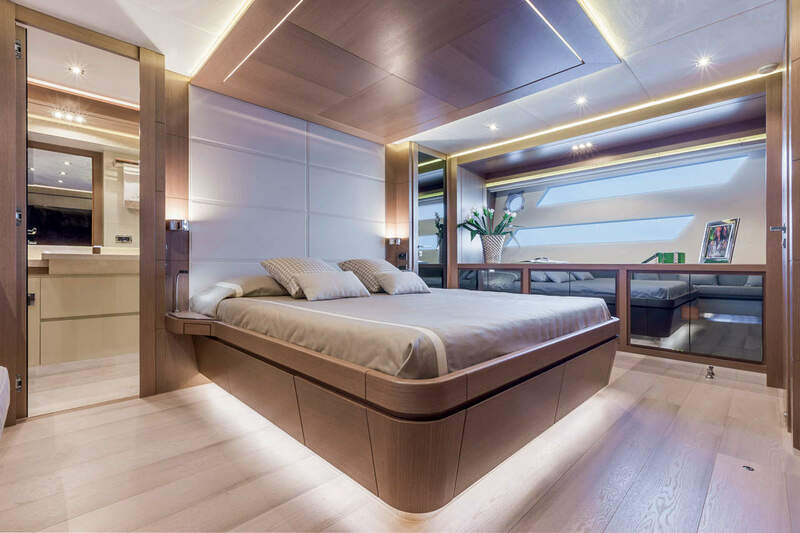 It is known that when it comes to interior design, Dominator is happy to meet their clients’ wishes and as they say, the sky is the limit – and the yard will find and use any fabric, material, or anything else the clients wants to see on their yacht. But Mancini’s work is perhaps most obvious on the lower deck, where cabins are not only large and comfortable, but beautiful, with no cramming or makeshift solutions. The interior is, as expected, stylish and elegant, rather understated. The real luxury, however, is again invisible – no matter the speed, all cabins and spaces enjoy perfect silence, with low vibrations or noise coming from the engine room. During our sea trial we confirmed our opinion of the Dominator 800 as a high-end motor yacht. Fast (the yacht we tested reached 34 knots of speed), maneuverable, swift in turns the latest yacht from Dominator is a wonderful display of possibilities of modern yacht-building. With this model, the builders from Fano prove themselves worthy of their spot in the probably most popular segment of yachts, and perhaps even more importantly, ready to accommodate all their clients’ wishes. In this way, the Dominator yachts are personalized and special, making their owners part of the family. What more can we say, but good job and best of luck in future endeavors.